A recent pilot programme by the British think tank Nesta and the Department for Digital, Culture, Media and Sport, Heritage Lottery Fund, Arts Council England addressed the lack of evidence of the financial and non-financial impacts of matched crowdfunding, defined as the process of combining crowdfunding with other forms of institutional funding. The pilot ran from September 2016 until October 2017 and provided a total of £251,500 or matched crowdfunding to arts and heritage projects raising between £4,000 and £40,000 on the Crowdfunder platform. Over that period, 59 projects successfully crowdfunded for their projects, while also receiving match funding on the platform. These projects raised money for a diverse range of projects from plays, to art exhibitions, to launching new apps to preserve heritage sites. MAIN FINDINGS. On the financial side, it emerged that matched crowdfunding can help leverage additional funds for arts and heritage projects. Moreover, it makes project more likely to be successful while increasing the average donation size. The non financial effects include the willingness of the crowd to contribute to the project beyond the sum pledged, thing which brought entrepreneurs new partners or collaborators in almost 50 percent of the cases. The majority of project backers live within 20 miles of where the project they supported is based. FOLLOW UP. A subsequent survey completed six months after the end of the programme and communicated in August 2018 shows that the long-term effects of a campaigns lies in the exposure the project gained during the raising phase. 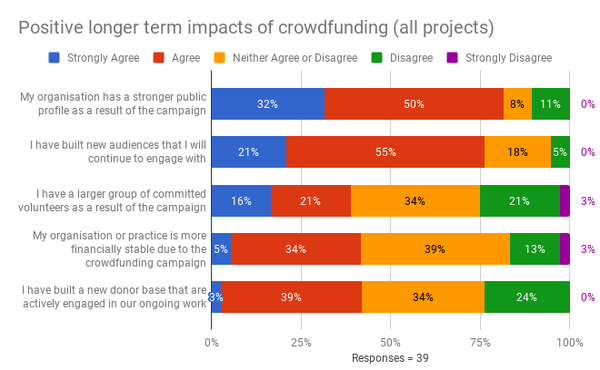 In particular, interviewees confirmed matched crowdfunding played a massive role in raising the awareness of the project thanks to the media exposure of the campaign (picture above) even though, in contrast, fundraisers reckon crowdfunding being massively time-consuming. Nice food for thought for crowdfunding consultants targeting smaller organizations!